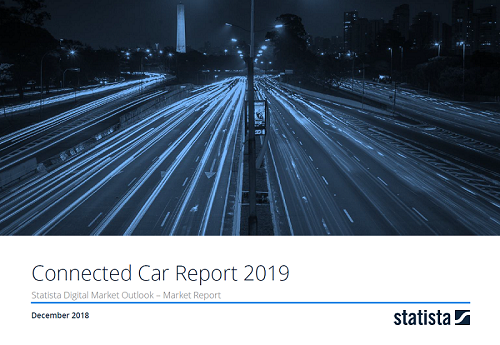 With this report we provide a comprehensive overview of the sate of the Connected Car market as it is today as well as a prognosis with detailed information on eight different market segments in the areas of Connected Hardware, Infotainment Services, and Vehicle Services. Besides all relevant market figures like total and average revenues, and user and subscription numbers for the years from 2018 to 2023, we furthermore give detailed insights on current trends, key players and important background knowledge of the Connected Car market. Increasing internet penetration inevitably leads to growth of digital services. This development has also reached the automotive industry. OEMs equip their cars with multiple digital components, offering a digital experience, increased driver safety and convenience to their customers. In this report, we define the Connected Car as a car that has a internet connection based on an embedded (eSIM) or external SIM-card, for example via tethering the driver’s smartphone. With this underlying definition, we divide the Connected Car market into a single fee hardware segment (Connected Hardware) and subscription based service segments (Safety & Security, Infotainment Services). Comparing the three major Connected Car markets – the U.S., China and Europe – the U.S. was the biggest market in 2018 but will be overtaken by Europe until 2023. With a CAGR of 18%, China shows the biggest growth. On a global level, revenues of US$18.4 billion in 2018 will grow to US$30.6 billion in 2023.